It's official. Companies have officially decided that no matter what the product, if you can attach a sports star or celebrity to it, regardless of whether there is even a remote connection between said person and the product, they will do it. 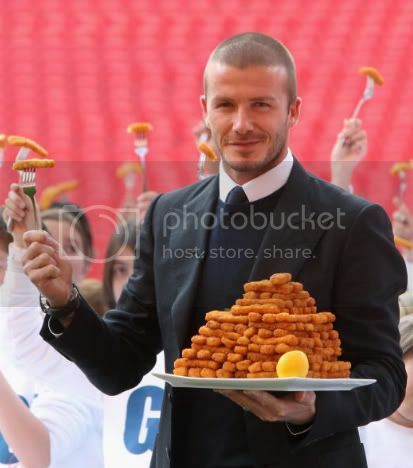 Introducing David Beckham's new line of Omega 3, heart-healthy food products, which includes "fish fingers". Says Becks: "As a Dad I know how hard it is to get kids to eat the right things. I also know as a footballer, how important it is to eat the right things to perform well, so I think the GO3 range is a great way to help families take some small steps to be fit and healthy at affordable prices." The only thing could have possibly made this worse would have been if his wife Victoria had endorsed it (for several reasons... use your imagination).